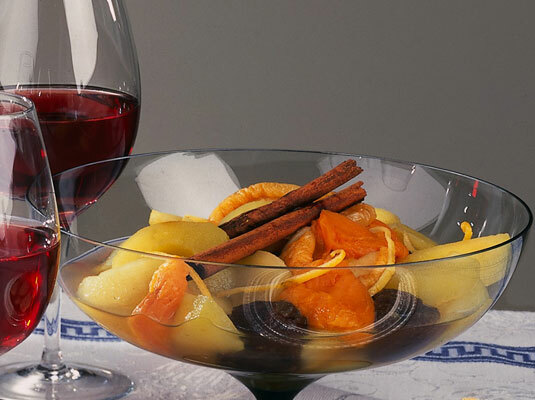 This fruit and wine compote is basically fruit poached in liquid with sugar, which forms a syrup. Compote is perfect for making ahead and tastes even better after it’s been refrigerated for a day or two. Vary the compote according to the seasons and to your taste. You can make it with firm, fresh fruit, such as apples or cherries, or dried fruit, such as prunes or figs (as in this recipe). Combine prunes, apricots, and wine in a glass bowl. Cover with a plate that fits inside the bowl to help keep fruit submerged. Let soak at room temperature for 30 minutes, or for 2 or 3 hours in refrigerator. Drain wine into a large saucepan. Peel and core the apples and cut them in thick slices. Put them in the saucepan of wine. Add the zest, cinnamon sticks, and sugar to the pan. Heat for 2 minutes, stirring gently to dissolve sugar. Add dried fruit to saucepan and enough water to barely cover the fruit. Simmer uncovered for about 15 minutes. You want the apples, apricots, and prunes tender when pierced with the point of a knife. Taste syrup and add lemon juice or more sugar, if needed. If adding sugar, stir very gently to dissolve it, without breaking up fruit. Pour compote into a glass bowl and let cool. Remove strips of lemon zest. You can leave the cinnamon sticks in the compote, if you like. Serve cold in bowls, or either warm or cold over ice cream.